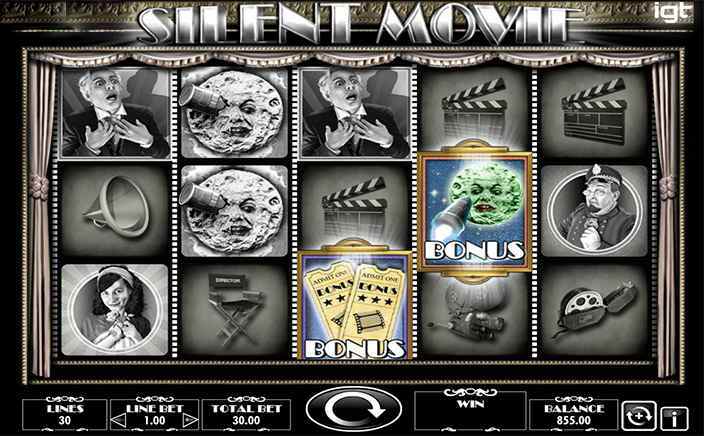 Silent Movie slots is a game developed by IGT Software having 5 reels and 30 paylines. Inspired by the old black and white silent movies, this slot has amazing music and sound effects from the vintage times. Various characters from the movies are also featured in the slot. Give this slot a spin or just pay a visit to Monster Casino to play it. Before beginning the Silent Movie slots, click on “Line Bets” to set the coin size ranging from 1 to 20. “Spin” will start spinning the reels after the bet has been decided. The symbols having high values are Muddy Romance, Keystone Kops, Mr Hyde and Dr Jekyll, and A Trip to the Moon. The wild symbol is the logo of the game. The symbols possessing lower values are a clapboard, a camera, the chair of a director, a loudhailer and a reel of a film. For the Mr Hyde and Dr Jekyll symbol to be triggered, the coloured symbols should be combined with the poster symbol of Hyde and Jekyll movie. Once this feature gets triggered, you will get 6 spins and all the wins will get multiplied by 3. Keep in mind that only the winning spins will be counted. The bonus feature named A Trip to the Moon will be triggered when the coloured symbols get combined with the poster symbol of this movie itself. Once the feature gets triggered, you will be awarded 10 to 15 free spins along with some wild symbols. Another bonus feature named Keystone Kops will be triggered when the symbols will get combined with the poster symbol of the movie Keystone Kops. After the feature gets triggered, you will be given free spins up to 10, a multiplier that ranges from 2x and 5x which will get doubled after 5 free spins. The Muddy Romance bonus feature will get triggered when the coloured symbols will get combined with the poster symbol of the movie Muddy Romance. Triggering of this feature will award you spins between 12 and 16 and also some scatter wins. The scatter wins will be multiplied by total bet. Having a medium variance this slot Silent Movie features a return to player percentage of 92.56% – 96.51%. Graphically fantastic, this slot is a tad different from the usual slots. 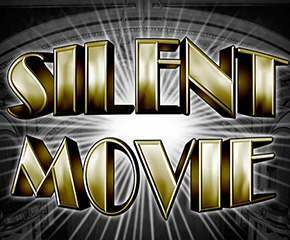 Set up in a nice atmosphere, Silent Movie slots manages to pay well through the bonus features present in it. The movie titles used are genuine which throw a light on the earlier days of cinema.